Loyiso Gola dives into years of pop culture and the way they have shaped our lives. 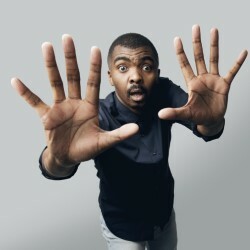 Loyiso is an incredibly high profile South African stand up, with 12 seasons of his two-time International Emmy nominated satirical news show Late Nite News with Loyiso Gola under his belt. As seen on Netflix: Comedians Of The World, Live at the Apollo and Mock the Week. 'An intelligent observer of the world' **** (Chortle). 'Fascinating, funny and a delight to watch… Very funny' (Voicemag). 'Behind his playful bewildered style is a brilliant comic brain' **** (Scotsman).